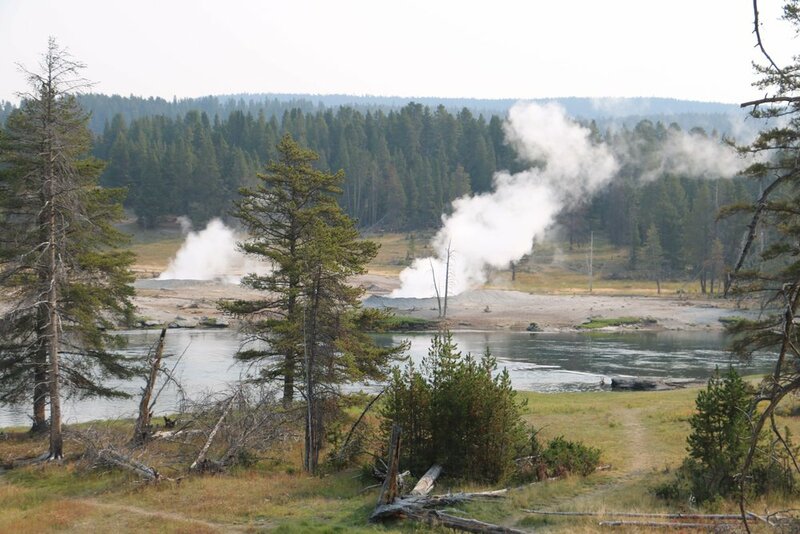 Yellowstone - America's first park! It's hard to know where to begin.... As I headed south from North Dakota, driving through the murky haze of the forest fires as I made my way to Billings, Montana then continuing to Wyoming, I really had know idea of what to expect from a national park that is larger than Rhode Island and Delaware combined. I choose my entry at the East Gate that led me from Cody, WY through both the Buffalo Bill Cody and the Shoshone National Forests, with the views I was seeing there, Yellowstone was going to have to pale in comparison. The smokey haze I had driven through to get here became ever more real as I wound my way through the east side of the park through forest that had been victim to fire years ago, some of which was making a feeble comeback. Big concerns were distracting me as I contemplated the dire affects of global warming we are experiencing this minute - Montana forest fires, Hurricane Harvey in Houston, Hurricane Irma about to bombard the Florida coast as I climbed and climbed to the heart of Yellowstone which sits right around 8,000 ft. (before you start to hike or climb! 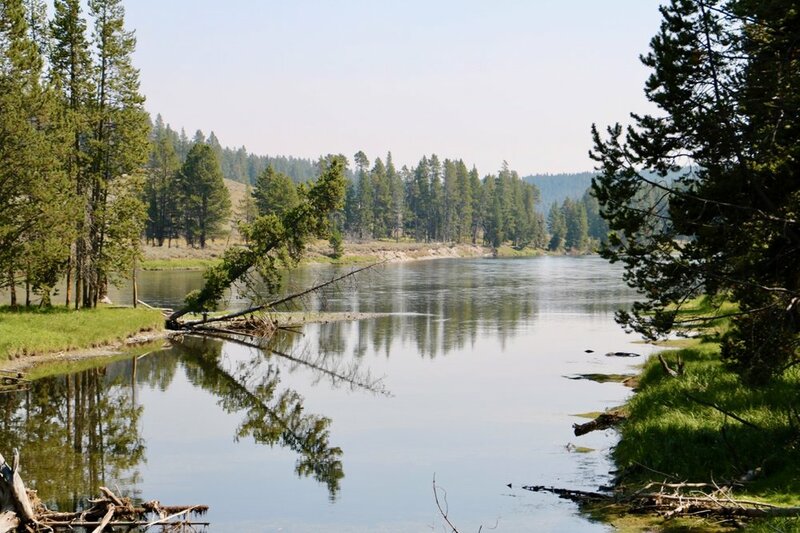 - yes, adjusting to the altitude was a real thing on the first day) Yellowstone is, in fact, an active super volcano which is why it is a super center of geothermal activity and geographical features in addition to the natural beauty and abundant wildlife. After having been travelling at a breakneck pace and putting thousands of miles behind me since I left Vermont, I was very glad to slow down and set up at my campsite knowing I wasn't leaving the park for the next 3.5 days! Sure, almost 4 days seems like a long time, but not in relation to the magnitude of this park and the distance one has to travel to see each thing. 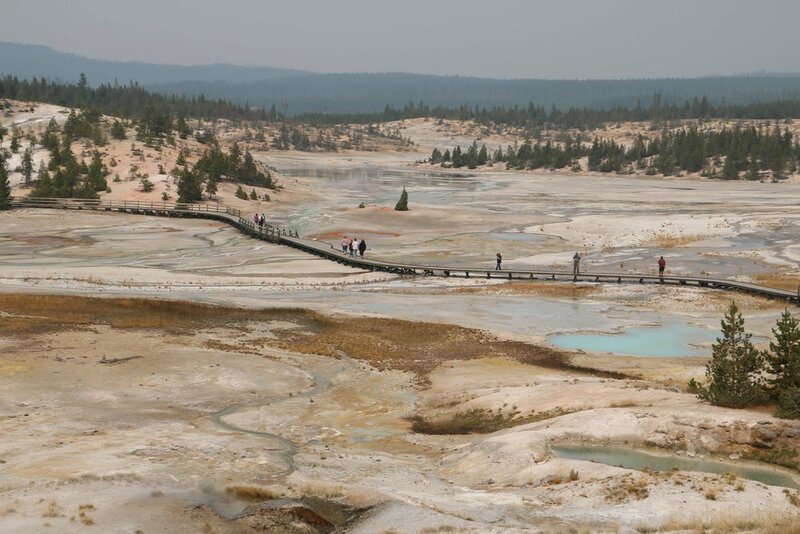 It could easily become a mad dash to tick off all the check boxes of "things I saw", but that is not my intention here and not how I wanted to approach Yellowstone. Instead, I took some time to put my feet in Lake Yellowstone (a stone's throw from my tent site) and decide what was important for ME to see, and then see those things well! Like in most things, when you start to peel back the onion you find there are many diverse layers to be found, the crowds at Yellowstone fit this bill as well. This is "America's Park" after all and unlike the Dakotas it seemed all of the U.S. and most of the world were represented. With this in mind, I started keeping track of license plates and with in one day i had seen plates from 49 of the 50 states (Hawaii was not represented for obvious reasons?) I was however the only car representing the Green Mountain State I could find in my stay in the park, good thing I was there! In addition to the checklist crowd, this group included dedicated birders, wildlife lovers, anglers, hikers, boaters, and total science nerds (they were some of my favorite!) and somehow being the person toting an easel, bag full of paint and what became a very recognizable hat made me not only approachable but a bit of a celebrity :) In my two instances that I properly set up to dig into a long painting, I talked to and shared with people from all over the country and also from as far away as Australia, Japan, China, India, Scotland, and Chile. There was an immediate commonality when they found out what I was about regardless of their politics (and they were diverse), culture, ethnicity, etc... this is a sacred space that needs protecting, cherishing, and better be around for our grandchildren and their grandchildren's grandchildren. Many felt the urgency to come now in fear of it being something taken away, while others wanted to show there support to the NPS with by upping attendence......out of sight, out of mind is a dangerous thing and if you haven't been to the parks, its hard to keep fresh in your mind why these are important places to protect. So I painted away, talked even more, and took dozens of pictures with people, some even asking for my autograph (which I tried to oblige without laughing out loud). 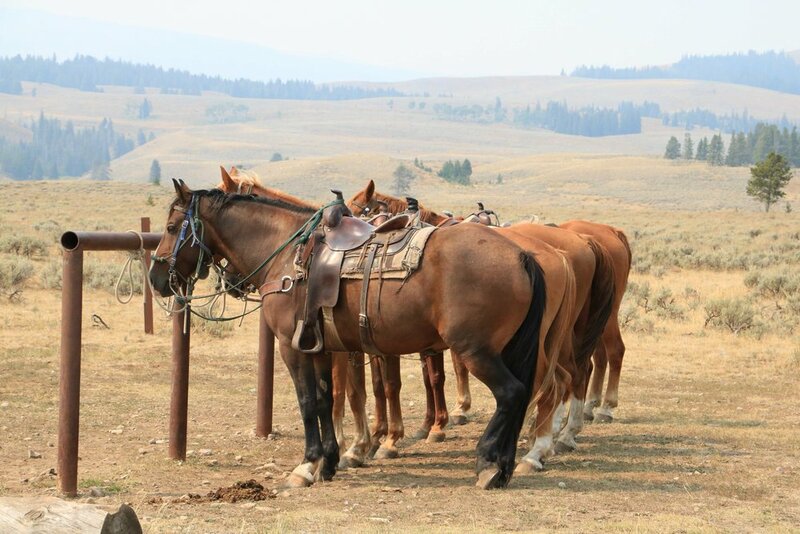 Park Rangers in Yellowstone were a bit less accessible than in prior parks, but with the mass crowds, infrastructure and 100's of programs, their jobs are immense. When I took the time to take part in a few ranger led programs, I was gifted with not only friendly and professional, but incredibly knowledgeable about all aspects of this scientific jambalaya of a landscape. When you are the one in the crowd asking questions and engaging in conversation, it's easy to continue after the fact conversations with rangers when the program ends...Maybe because we were standing on the crater of an active volcano and all the natural catasrophies happening around the country, conversations after the fact easily flowed to fears and concerns about the effects of rapidly increasing climate change, disregard of scientific evidence, deregulation of EPA standards, and NPS funding. My hat is off to these amazing ambassadors, protectors, and educators of our most important places in our country. Newer PostGrand Teton National Park! Older PostTheodore Roosevelt National Park!